4/4 Engine Speed: This is the maximum speed this destroyer will reach in a straight line without the Sierra Mike signal. Note this may exceed the listed maximum speed in port. Turning Speed: A ship decelerates as it rotates through the water, reaching a fixed maximum speed in a turn. This is again at the 4/4 engine setting. Normally for a destroyer, they can only manage about 83% to 85% of their maximum speed in a turn. With the new engine setting, this value increases to a value between 97% to 98.5%. Port Turning Radius: This is the value you’ll find in port for the ship’s turning radius. Old Turning Radius: By taking the ship’s speed and multiplying it by the time it took to rotate 360º and then applying a formula, the circumference of the ship’s turn can be calculated. This can sometimes differ from value listed in port and needs to be checked. Note this value is rounded to the nearest 10m and represents an approximate. A difference of +/- 10m being nothing to be concerned about. 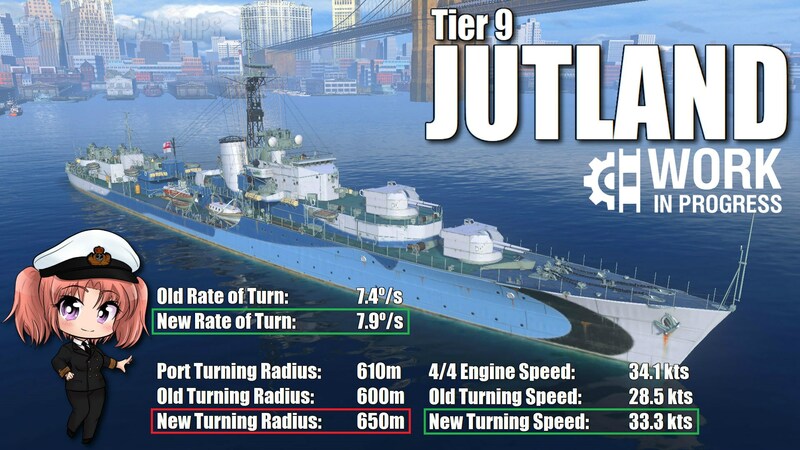 New Turning Radius: The port turning radius is calculated with the assumption that a destroyer will be turning at 83% to 85% of its maximum turning speed. When this value changes, the turning radius changes too. Ships have their smallest turning radius at speeds between 15 and 20 knots. At speeds greater or smaller than this, their turning radius increases. 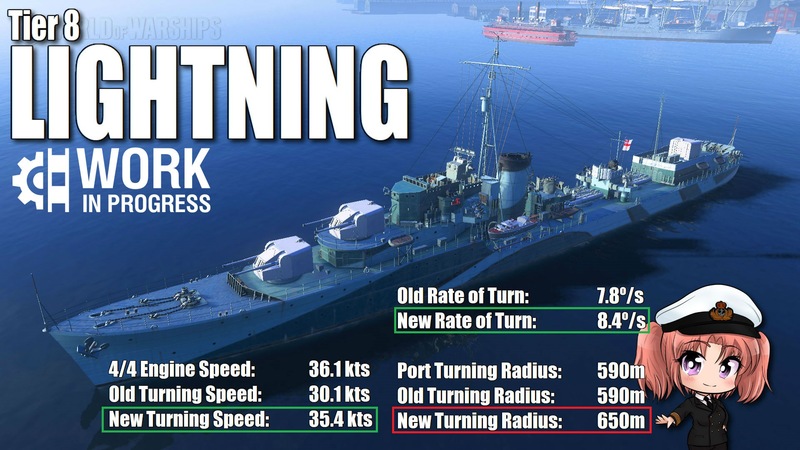 The new speeds that the British destroyers achieve in a turn are NOT factored into the turning radius listed in port. This is a problem that also exists for British cruisers. Overall, this is a significant buff. Not only does it largely mitigate the absence of the Engine Boost consumable (which British destroyers lack), the increased acceleration they enjoy is far superior to that than would be provided by the Propulsion Modification 2 upgrade. Thus, they can take Steering Gears Modification 2 and reduce their rudder shift time to increase the comfort of their handling further still. These ships feel much more fun to sail in their current configuration, upgrading from a sluggish, slow Japanese destroyer type handling to that of a fast Soviet destroyer. As far as gimmicks go, it’s not game breaking. 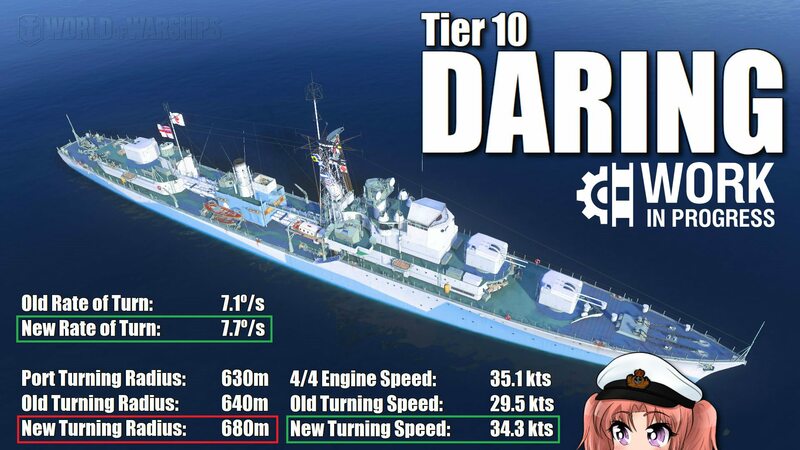 Having seen it already in the British cruisers, I find it more palatable. 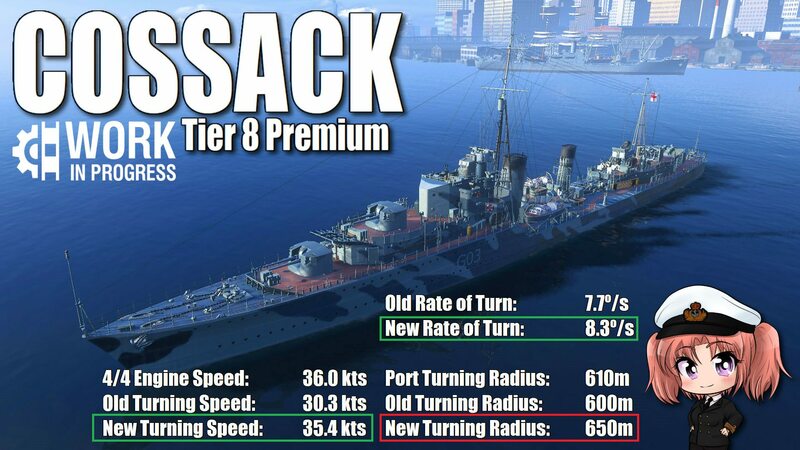 I’ll be keeping a close eye on the development of these ships and I’ll let you know about any further changes to their agility and how it affects the numbers shown here. Great info April, well done!